This easy-to-use, fun program lets you stack images upon images in a variety of fashions to create great-looking collages that would take forever to make by hand. 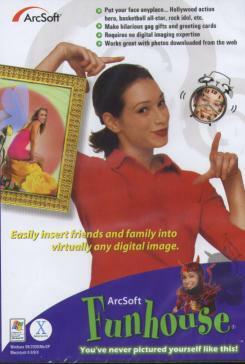 With ArcSoft Funhouse you can put your mum's head on your cat's body - put your head on Pamela Anderson’s body, you can have fun and create some really unique cards or posters! 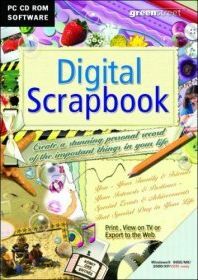 Digital scrapbooking application that turns ordinary digital pictures and text into personalized works of art. 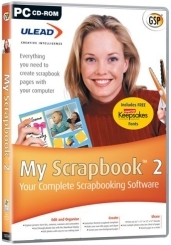 The program includes everything one needs to turn regular digital photos and text into great-looking scrapbook pages suitable for printing, adding to a scrapbook, sharing with friends or hanging on the wall. An exclusive gallery of ready-made scrapbooks, pages, art, captions, backgrounds, and accessories to create and print treasured memory albums — and much more! Ulead My Scrapbook 2 offers everything you need to create scrapbook pages, background paper, clip art and titles on your computer. Customize and print a variety of scrapbook-themed pages and background paper.